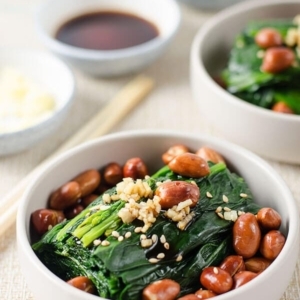 Blanched spinach and fried peanuts are served in a gingery vinegar dressing. 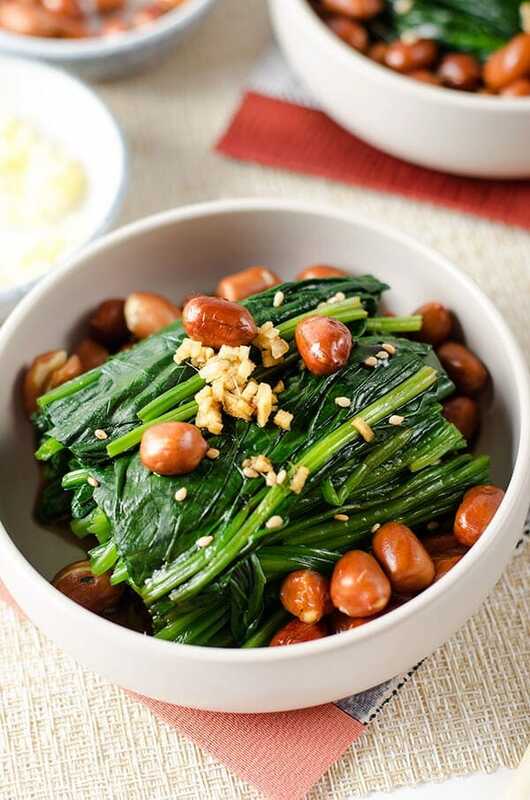 The tender spinach and crispy peanuts give you a satisfying mouthfeel. The tart vinaigrette is slightly sweet and tastes so refreshing. It’s simple, highly nutritious, and easy to cook. 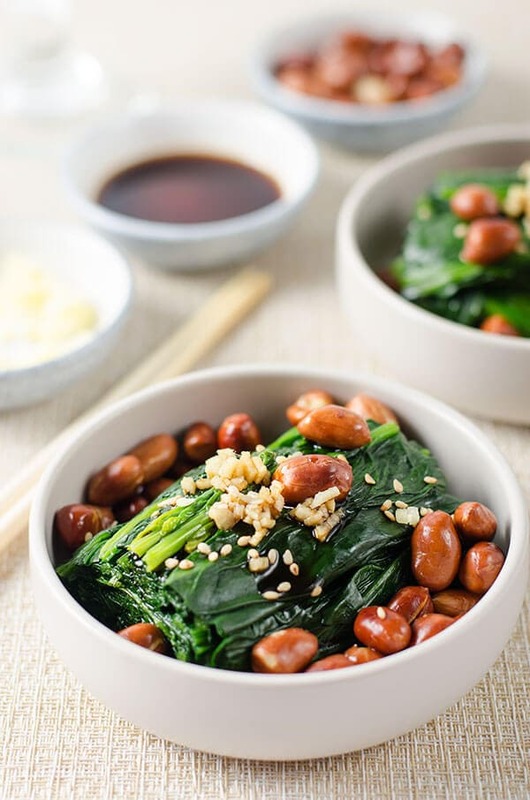 Chinese spinach and peanut salad is a combination of “old vinegar peanuts” (老醋花生, lao cu hua sheng) and Chinese style spinach salad. The two dishes are both stars in local Chinese restaurants and sometimes people serve them together to create a better mouthfeel. 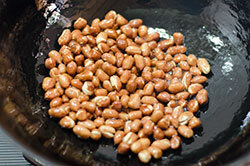 To cook vinegar peanuts, the peanuts are quickly deep fried until crispy and then drizzled with a pungent vinegar dressing. The peanuts are buttery and crisp, while the vinegar adds great flavor and makes the dish more appetizing. 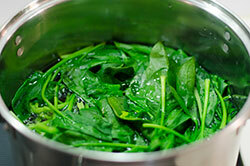 The spinach salad shares the same idea, and the blanched spinach is served with the same vinegar dressing. Both dishes are served as simple appetizers, or so-called cold dishes (凉菜, liang cai), in China. The vinegar sauce is the key. It usually uses old vinegar (老醋, lao cu), a Chinese aged black vinegar that is close to balsamic vinegar. The idea of the dressing is close to that of an Italian style balsamic vinaigrette too – the vinegar is mixed with herbs, oil and spices. 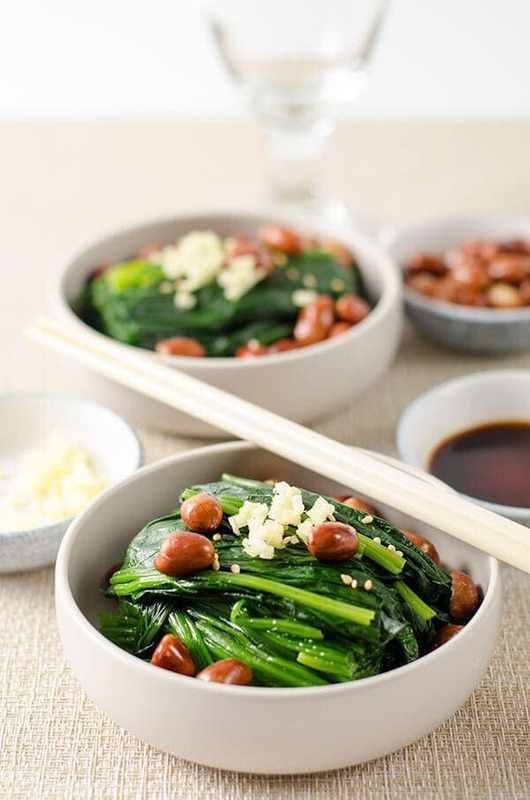 But instead of using olive oil and black pepper, the Chinese one often uses the combination of ginger, garlic, soy sauce, oyster sauce, white pepper, sesame oil, roasted sesame seeds, sugar, and salt. It has a sweet nuance and a savory hint, but the refreshing sourness dominates the flavor. In this recipe, I tried to reduce the seasoning to a minimum. My goal is to create a great tasting dressing with minimal effort. 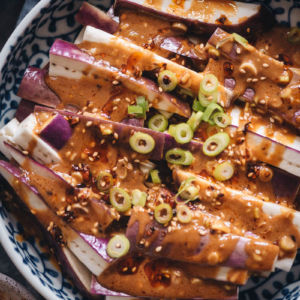 You can use Chinkiang black vinegar instead of old vinegar, but make sure to use Chinese black vinegar to make the dressing. The pale-colored rice vinegar is too fruity and not as tart, making it unsuitable for this dish. Add peanuts to cold oil and slowly heat up the skillet. This will help you avoid burning the peanuts and splattering oil everywhere. The peanuts cook slowly and become crisp after cooling. The peanuts won’t absorb the cooking oil during the frying process, so don’t worry about extra calories from the oil. Squeeze the extra water from the spinach by hand after draining.You might be surprised by how much the spinach shrinks, but the small portion is very concentrated in flavor, with a great texture. Add peanuts and dressing right before serving. The peanuts will get soggy if added too early. Do you like my recipe? 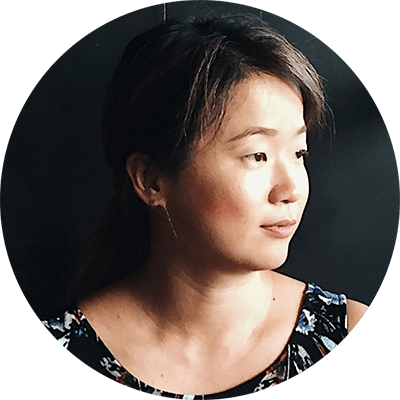 Sign up for Omnivore’s Cookbook’s weekly newsletter and get a FREE e-cookbook! Bring a large pot of water to a boil. Add spinach and cook over medium heat until cooked through, about 2 minutes. 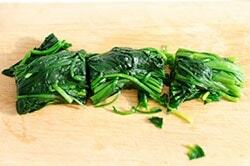 Drain spinach and set aside to cool. 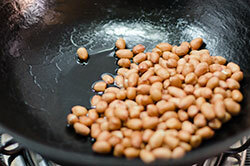 Add oil and peanuts to a wok (or small skillet). Heat over medium heat and stir with spatula continuously, until the skin of the peanuts turns dark brown and the edges turn golden brown. Turn off heat immediately and transfer peanuts to a plate to cool. 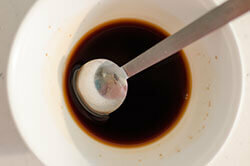 Combine black vinegar, light soy sauce, sugar, and salt in a small bowl, mix well, and set aside. When spinach is cool enough to handle, squeeze extra water out of it with both hands. 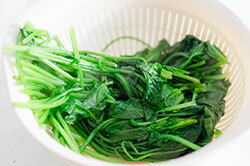 Chop spinach into pieces about 8 centimeters (3 inches) in length and transfer to several small serving bowls. Right before serving, top spinach with peanuts and drizzle with the vinegar sauce. Garnish with sesame seeds and serve immediately. This recipe employs basic Chinese ingredients and preparation methods. 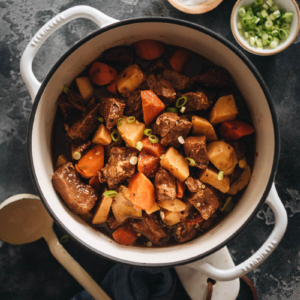 If this is your first time using one of my recipes, I strongly recommend you spend a few minutes browsing the essential spices for Chinese cooking on the pantry page. 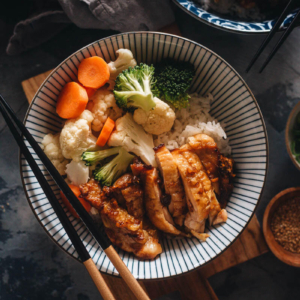 The page includes tips on how to select the most basic spices for Chinese cooking, as well as on measurement and preparation of fresh herbs. These are key to successfully cooking authentic Chinese dishes. 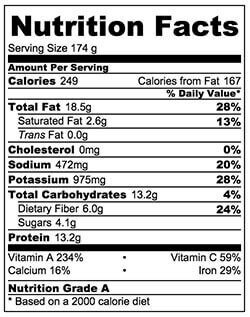 The nutrition facts are calculated based on 1 of the 4 servings generated by this recipe. 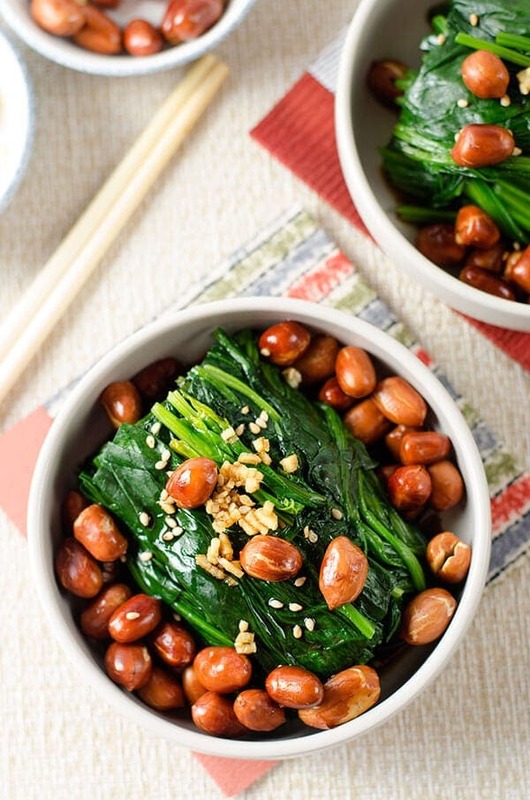 Spinach salad is one of my favorite Asian dishes. The way you cut your spinach is really pretty! I like how it’s in a neat little block. The light sauce looks great, and this is super healthy. Pinned! I love the flavors in this salad Maggie! 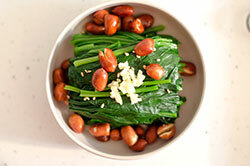 I recently tried blanched spinach salad, but it was definitely missing something-the crunch from the peanuts. Very easy to make, too! 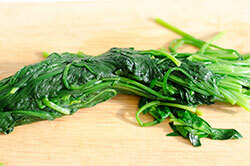 Spinach is one of my favorite veggies, and this certainly sounds like an interesting way to prepare it. Also, I’m not great at creating flavor packed salads, but the flavor combos in this sound out of this world!